The bq24725A ( Marking : BQ25A ) is a high-efficiency, synchronous battery charger, offering low component count for space-constraint, multi-chemistry battery charging applications. 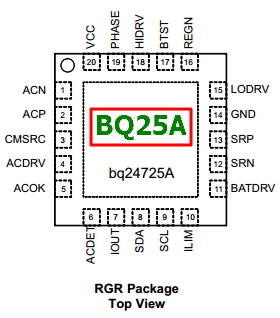 The bq24725A utilizes two charge pumps to separately drive n-channel MOSFETs (ACFET, RBFET and BATFET) for automatic system power source selection. 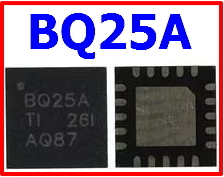 The bq24725A uses internal input current register or external ILIM pin to throttle down PWM modulation to reduce the charge current.